LOS ANGELES--(BUSINESS WIRE)-- Skechers Performance returns as title sponsor for the 2019 Skechers Performance™ Los Angeles Marathon® on Sunday, March 24. At the big event and throughout race weekend, the performance brand will offer exclusive race-branded merchandise to runners as well as fans. And the world will be watching as 2016 and 2018 Skechers Performance Los Angeles Marathon winner Weldon Kirui returns to compete for a record-breaking third victory at the race. Visitors to the Skechers Performance booth at the Health & Fitness EXPO in the Los Angeles Convention Center will have the opportunity to meet Weldon, as well as four-time Olympian Meb Keflezighi on Saturday, March 23 at 11AM. Meb will also be signing his new inspirational book, 26 Marathons: What I've Learned About Faith, Identity, Running, and Life From Each Marathon I’ve Run (Rodale Books), which will be available for purchase. A two-time champion of the Los Angeles Marathon, Weldon was born and raised in Kenya and is one of the most accomplished distance runners in the world. His marathon personal best of 2:09:06 was set at the Eindhoven Marathon in the Netherlands and his wins include the Kass Marathon (Kenya National Championship in Eldoret) and the California International Marathon in Sacramento. Weldon has also been the champion of the AFC San Diego Half Marathon in California and the Krems Half Marathon in Austria, setting his personal record at that distance in a time of 61:10. When in Los Angeles, Weldon works with “Students Run LA”—a program for at-risk high school students who learn goal-setting and character development while receiving adult mentoring and improved health by training to run the LA Marathon. Since its debut with the first model of Skechers GO RUN® worn by Meb Keflezighi in 2011, Skechers Performance footwear has earned respect throughout the running world and won numerous awards within the footwear industry. Skechers Elite runner Edward Cheserek trains, races and has won numerous events in footwear featuring the new Hyper Burst midsole. The Skechers GO RUN collection for men and women is available at Skechers retail stores and skechers.com as well as select retail partners. 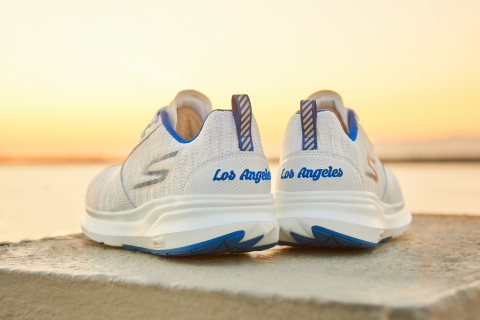 Based in Manhattan Beach, California, Skechers (NYSE:SKX) designs, develops and markets a diverse range of lifestyle footwear for men, women and children, as well as performance footwear for men and women. Skechers footwear is available in the United States and over 170 countries and territories worldwide via department and specialty stores, more than 3,000 Skechers Company-owned and third-party-owned retail stores, and the Company’s e-commerce websites. The Company manages its international business through a network of global distributors, joint venture partners in Asia and the Middle East, and wholly-owned subsidiaries in Canada, Japan, India, throughout Europe and Latin America. For more information, please visit about.skechers.com and follow us on Facebook, Instagram, and Twitter.